A common thread runs through the answers given to beginners asking how they can improve at chess. This thread is threefold: practice tactics, play slow games and review your games. The first two are easy. There are many resources to practice tactics and online it is easy to search for games with slow time controls. Of course standard over the board games are at a generous pace too. It is the third part of this universal threefold answer that poses problems. As a beginner my immediate reaction was, what is the point of me reviewing a game? If I had better ideas, I would have used them during the game! It felt like a clear example of something belonging in the ‘Unknown’ quadrant of the Johari window; I do not know what I do not yet know about positional analysis, or chess in general. But I now believe this view is wrong. There is definite value in analysing and annotating your own games. You need to understand where you go wrong before you can improve and only your own games will give you this information. And of course you have insider information on your games: you were deeply involved in every move and every position, you have already considered and discarded alternative candidate moves, you know of special circumstances which may have affected your play. In order to make the best use of the time I spend analysing my games, I have read and listened to various people’s views – credit at the bottom of the post. Here is my summary of what I have found. Recording time taken while you are playing the game. Post-mortem analysis with your opponent and/or mind dump of your thoughts straight after the game. Analysing your game – the meat of the process. Blunder checking with a chess engine. Recording what you have learned. When you get to phase 3, you’ll see that one of the things you need to do during analysis is to focus on critical moments in the game. One way to identify critical moments is to find the moves you spent most time on. It is therefore good practice to record this data while you play. The simplest way might be to record the total time left on the clock after each move. Remember to do it for both you and your opponent, else you will be counting your opponent’s thinking time as your own. Take a notebook with you when you play. As soon as you finish your game ask your opponent if they would like to review it with you. Take your notebook and pen, find a quite spot and play through the game, asking them what they thought at various stages, which of their moves they were unsure about, which of your moves surprised them and which of your moves they thought were weak, taking notes as you go. When the dual review has been completed, or if your opponent did not want to join you, write down all your own thoughts about the game. Have a look at your scoresheet and focus on the moves where you took a lot of time: what other candidate moves were you considering; was there a particular threat you were concerned about? These thoughts may later help you understand the type of mistake you made. If there were things external to the game that may have affected you, record them too. This might be how you felt, or excessive noise from the hallway as the amateur drama luvvies left their rehearsal during move 23. This is where the real work happens and it is worth breaking it into parts. First, some general notes. Have a goal (other than general improvement), but don’t set the bar too high. Your goal might be to find at least one mistake you made. IM Pruess defines a mistake in this context as follows: a move is only a mistake if there is a better move that could have been played. Your job is to find that better move. Don’t expect to have ‘eureka moments’. Sometimes you might, and that is great, but the more important role of analysis is the process of thinking about alternatives and visualising them before playing them. Yes, game analysis is another opportunity to hone your visualisation skills. Pretend you are analysing your worst enemy’s game; you WANT to find mistakes. Use the notes you made during Phase 2. Part 1: Play through the game at a fairly quick pace, just to get a feel for it and to refresh your memory. 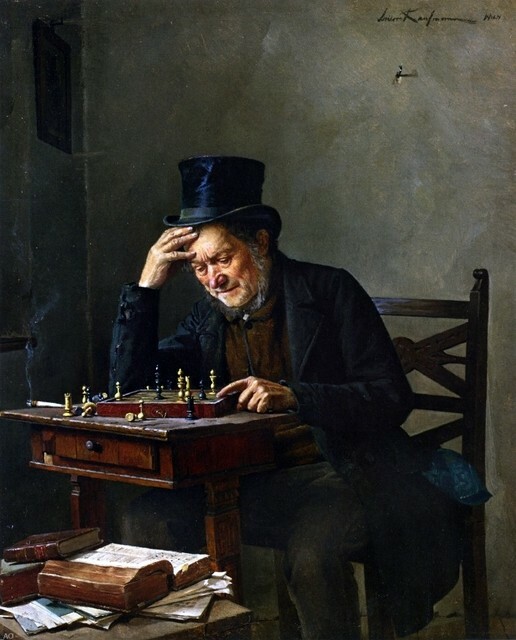 Transitional moments, that is, the move where you were first out of your opening knowledge, and the move(s) where you feel the game moved from middle game to endgame. Known mistakes, for example if you blundered during the game and it had an obvious impact, such as losing a pawn, a piece, or the Exchange. Possible mistakes, for example if you feel you had a won game and it ended in a draw, where do you think the momentum shifted? A logical way to approach this part may be by game phase. If you play to a specific repertoire, see if you played your preferred line. Use this opportunity to reinforce that line of your repertoire. If your opponent played an unexpected line, refer to your opening reference book, or an online source such as 365chess.com, and add what you learn to your repertoire notes and your game annotation. If you were out of known lines very early on, then challenge your first ten moves against your opening principles. If any move was not in line with the principles, can you justify why not? For each of the critical moments, decide on three or four alternative candidate moves. You may want to use your move selection checklist for this purpose. Now you have the luxury of time, see if your checklist does what it is designed for, which is to find the best candidate moves. Play through a few variations for each candidate move and analyse the position at the end of each variation. Do you stand better, the same, or worse than in the actual game? If you stand better, you may have identified a mistake. When you have found a mistake, make a note why it was made; what was the origin or type. Then over time you can see if there is a pattern across your games and fix it. Do it in plain English, expressed as an explanation or principle. Make these new notes (as opposed to your Phase 2 notes) in a different colour or font, so that you can distinguish them later. If you blundered during the game, chances are you either saw it during the game, or you found it during Phase 3. Only now should you give your game to a chess engine to find blunders you have not yet identified. How you define a blunder is a personal choice and depends partly on your playing strength; find a depth and value that works for you. You could also let the engine loose on positions where you realise there was a momentum shift, but you don’t understand why. The engine may reveal ideas you have not considered. When you use computer output in your annotation, mark it (say with a ‘C’), so that in future you know where you needed help. The final phase is to record what you have learned. There are two aspects to this. The first consists of the candidate moves and variations you entered. The second is the plain English lessons. You could also express how the game was decided – why did you lose, win or draw; what was the key turning point, strategy, blunder, etc. Save the game into your database, print the output and file it with your other games. ohh dear!! really very helpful!!! One suggestion: It is a bit meticulous to do, but graphing the evaluation of each ply by a chess engine, then graphing it will tell you how well you and your opponent played. Graphs with big swings indicate poor play by one or both sides (and rarely something erratic with the engine’s analysis). If you punch in, for example, a pgn from the game of two GMs, the curves will be slow and smooth, usually. The goal for the improving player is to get rid of all the zigs and zags. Do you have a link that would take me to that feature? I gave a cursory look, but I could not find it. Thanks.